There is dancing, singing, drama, devotional music and puppet shows and other community festivities which transform the hardworking Rajasthani into a fun-loving and carefree individual. Each region has its own folk entertainment, the dance styles differ as do the songs. Interestingly enough, even the musical instruments are different. This is basically a community dance for women and performed on. auspicious occasions. Derived from the word ghoomna, pirouette, this is a very simple dance where the ladies move gently, gracefully in circles. This is one of the many dance-forms of the Bhil tribal. Performed during Holi festival, this is among a few performances where both men and women dance together. This most sensuous dance performed by the Kalbeliya (Snake-charmar`s community). The sapera dancers wear long, black skirts embroidered with silver ribbons. As they spin in a circle, their body sways acrobatically, so that it is impossible to believe that they are made of anything other than rubber. As the beat increases in tempo, the pace increases to such a pitch that it leaves the viewer as exhausted as the dance. Another Holi dance but performed only by men. This becomes Dandia Gair in Jodhpur and Geendad in Shekhawati. This is popular in the Kisherigarh region and involves dancing with a chari, or pot, on one’s head. A lighted lamp is then placed on the pot. This is a dance performed on dummy horses. Men in elaborate costumes ride the equally well decorated dummy horses. Holding naked swords, these dancers move rhythmically to the beating of drums and fifes. A singer narrates the exploits of the Bavaria bandits of Shekhawati. The Jasnathis of Bikaner and Chum are renowned for their tantric powers and this dance is in keeping with their lifestyle. A large ground is prepared with live wood and charcoal where the Jasnathi men and boys jump on to the fire to the accompaniment of drum beats. The music gradually rises in tempo and reaches a crescendo, the dancers seem to be in a trance like state. This is a professional dance-form from Jalore. Five men with huge drums round their necks, some with huge cymbals accompany a dancer who holds a naked sword in his mouth and performs vigorously by twirling three painted sticks. The Kamad community of Pokhran and Deedwana perform this dance in honour of theft deity, Baba Ramdeo. A rather unusual performance where the men play a four-stringed instrument called a chau-tara and the women sit with dozens of manjeeras, or cymbals, tied on all over their bodies and strike them with the ones they hold in their hands. Sometimes, the women also hold a sword between their teeth or place pots with lighted lamps on their heads. 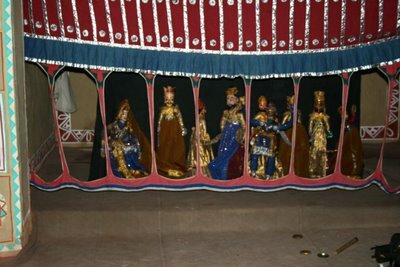 Puppet plays based on popular legends are performed by skilled puppeteers. Displaying his skill in making the puppets’ act and dance, the puppeteer is accompanied by a woman, usually his wife, who plays the dholak, or drum and sings the ballad. A 14th century folk hero, Pabuji is revered by the Bhopa community. The phad, or scroll, which is about 10 metres long, highlights the life and heroic deed of Pabuji. The Bhopas are invited by villagers to perform in their areas during times of sickness and misfortune. The ballad is sung by the Bhopa as he plays the Ravan-hattha and he is joined by his wife who holds a lamp and illuminates the relevant portions at appropriate points. Rajasthan’s most sophisticated style of folk music and has come a long way from the time it was only sung in royal courts, in praise of the Rajput rulers. Professional singers still sing the haunting ballads of Moomal Mahendra, Dhola-Maru and other legendary lovers and heroes. Pakhwaj is an Indian Percussion instrument is known as the mother of North Indian style drumsthe universally famous drum Tabla was born fromPakhawaj. There is a very interesting story that goes with it. That the famous musician of his era, Amir Khusro was once giving a performance on Pakhawaj and while at it, the pakhawaj broke in two pieces. Hecontinued to play with the broekn pieces, and to his own surprise it worked and this is how the new instrument called Tabla was born. 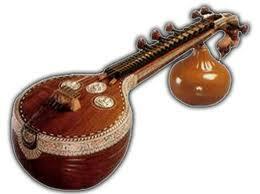 According to another folklore Iit is believed that Lord Ganesha uses this instrument. The pakhawaj is known by many names, like the mardal, pakuaj, pakhvaj and mardala. Pakhawaj is an Ancient percussion instrument shaped like a barrel, that greatly resembles the mridangam. The Kamaycha has a big, circular resonator which produces a deep booming sound. 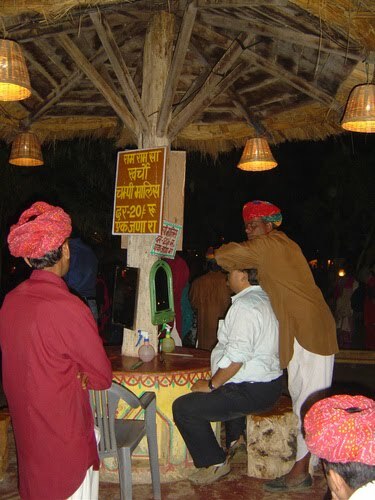 It is used exclusively by the Manganiyars in the Jaisalmer-Barmer region. So deeply is the sense of tune and rhythm in the mind and ear of the folk musicians, that they need nothing more than intuition and a highly trained ear to tune their instruments. 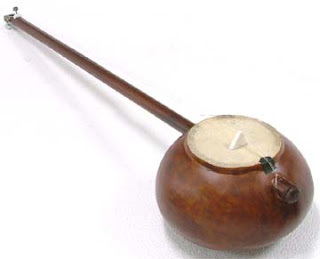 The Nagara is a conical drum played with the Surnai and Nafeeri (the two sticks). It forms part of the orchestra for the folk operas by providing rhythm.Nagada are an Indian Percussion Instrument which resemble the kettle drums of the old naubat. Naubat is the traditional ensemble of nine instruments. These Nagada are around 1 to 2 feet in diameter, and played with sticks. This 2-headed goatskin drum, nagada has a handle and it comes with a curved beater. This stick or beater helps to gently strike it on the drum to create the sound.In the modern times this instrument has generally been used as an accompaniement to shehnai. Nagada is a percussion instrument that resembles the'Dhol',which is also an Indian Percussion Instrument.Nagada is known by many names. For example, Nakkara, Nagada, Dugdugi etc. According to B. Chaitanyadeva, Nagada is a changed form of the ancient Dundubhi. Nagada has been inspired from Dundubhi. In Himachal Pradesh in Northern India also, Nagada's similar version can be found: Here its upper side is covered with leather of goat or goat skin. Nagada is slightly smaller in size than the 'Nobat'instruments. The percussion instrument 'Nagada' is played with it with a stick or piece of wood tp produce the produced. Khanjari: Small sized frame drum struck with hands found in northern villages and may have jingles. The twin faced drum is a must for any celebration in Rajasthan. Created in wood, this instrument gives a new soul to music and dance with its resonance and beat. and dance with its resonance and beat. Ravanhatthais a royal string instrument older than the Sarangi. Minstrels themselves played it in older days. It has string with ghunghroos tied to the rod, which rubs over the string giving captivating taal (rhythm) to the song being played. Rawanhathha Probably the earliest instrument played with a bow, and this humble instrument could well be the precursor of the violin. It has two main strings and a variable number of supporting strings, with a belly of half coconut shell and a body of bamboo. The bow has ghungroos (bells) attached to it. The music is staccato and accompanied by the syncopated singing of the Bhopa and the Bhopan.The Jogis of Abu Road area use a smaller version of the Rawanhathha which has its two main strings tuned to the 'Sa' of the Indian octave and a third of steel to 'Pa'. The Langas use the Sindhi sarangi. It is made up of four main wires, seven jharas and seventeen tarafs. Others members of the family are the Gujratan, Jogia and Dhani sarangis. The Surinda, favourite of the Manganiyars, is a small sarangi. 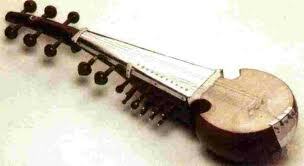 The Chikara, used by the Meos and Jogis of Mewat is a replica of the Sarangi. 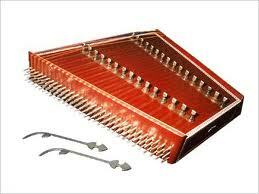 A slender instrument used particularly at the time of weddings, is sahnai. A double-beating reed instrument consisting of a single piece wooden tube with a opening and a metal mouthpiece, it is played as an accompaniment to nagara. The Algoza, common in the Tonk-Ajmer areas, is like two flutes played together. The Kathodis use the Pawri, a flute of bamboo held vertically. The Bhils use a short flute in some of their dances. Ceremonial music is provided by Nafeeri and Surnai, both rudimentrary forms of the shehnai .Then there is the Poongi of the snake charmers and its adaptation by the Langas called the Murla. Both have two tubes, one for the notes and the other for the drone. The enchanting music for song is provided by the Algoza. An instrument belonging to the regions Tonk, Ajmer consisting of bamboo flutes played together. It is a vertical flute with a single long hollow tube, into which the player whistles, at the same time gurgling a song in his throat or actually singing intermittently. The effect is haunting. The Satara of the Langa tribe has one long flute producing music most evocative of the desert. It is a vertical flute with a single long hollow tube, intowhich the player whistles, at thesame time gurgling a song in his throat or actually singing. Poongi : The snake charmers use it. It has two tubes, one for the notes and the other for the drone. The Ghanti or the Ghanta are commonly used and the ghungroo(ankle bells) form an integral part of music. The Bhopas of Bherunji wear large ghungroos around their waists and sway their bodies to provide a rhythm. The war dance of the Godwad area, the Ramjhol, is performed to the rhythm of the large ankle bells. Then there are the Manjeeras which are made of brass in the shape of hemispherical metal cups struck against each other. The Sarangi is the most important instrument in the folk music of Rajasthan. Probably the ancestor of violin, this instrument has two main stringsand a variable number of supporting strings, with abelly of half a coconut shell and a body of bamboo. 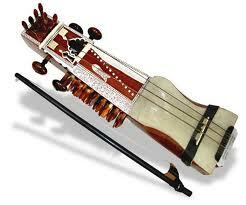 The Sarangi serves as an echo of the singer. And accompanying the Sarangi is the Dholak. it is a two-sided drum like structure made of wood with membranes covering the hollow structure with adds rhythm to the soul-stirring music. Chokhi Dhani has been touted as a must see location in Jaipur and I agree after the visit there this Monday. It is best enjoyed with family and friends. It is a typical village setting with everything except farming thrown in. performers spread across the campus. We watched three sets of traditional Rajasthani dancers performing to the tunes of traditional music. Every now and then, the visitors can join the dancers for a few minutes. There are magicians and a puppet show to keep one and all amused. One can ride a camel. There are camel, horse and bullock carts adding to the variety.Elephant ride catches the fancy of the young and the old. Jaipur is a dusty place and the path taken by various animals and carts have been doused with water to reduce the dust pollution. The rides are very reasonably priced. There is no extra charge for cameras. This is a welcome exception as the camera charges elsewhere in travel destinations in Jaipur and other towns in Rajasthan is several times the entry fee. At Chokhi Dhani the entry fee is for the sumptuous dinner. One as a choice of sitting under a roof or open space for dinner. It is out and out Rajasthani cuisine and one can hog as much as one wants.The food is served by well trained employees who do not allow one's plate to go clean until one gets up. A visit to Chokhi Dhani while at Jaipur is a must to get a complete flavour of Rajasthan. 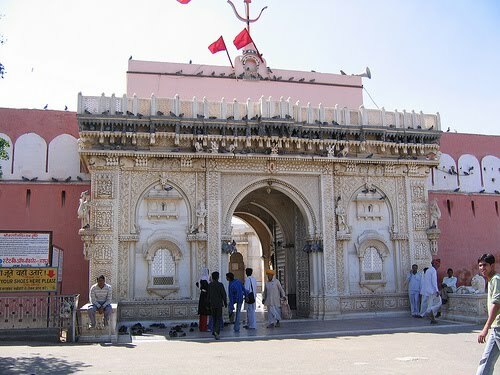 Karni Mata temple in Deshnok, Rajasthan, India. 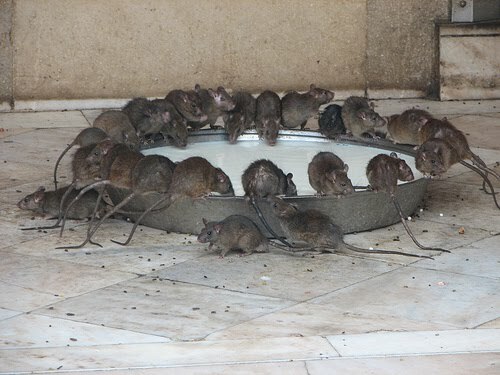 The temple is also sometimes called “The Rat Temple”. This Hindu temple is devoted to Karni Mata, a goddess who is said to have reincarnated her devotees into rats upon death. 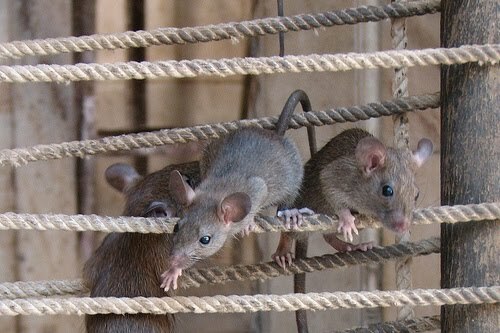 Today the temple is home to hundreds of rats which represent the reincarnated. 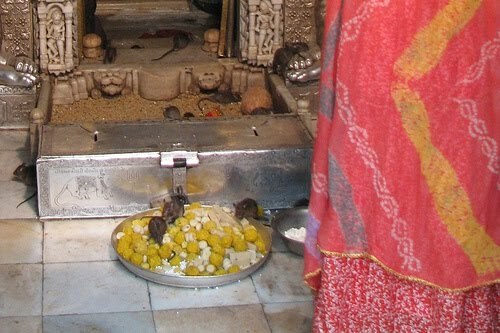 Hindus come to worship at the temple and bring offerings of sweets to the rats. 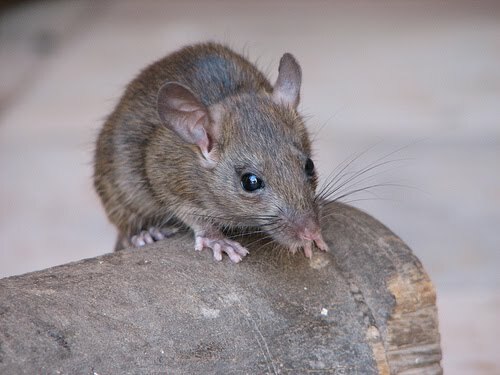 The rats are sacred, and it is said that if you kill a rat (by accidentally stepping on it), you must replace the rat with its weight in silver. Because of the somewhat sensational nature of the temple, it has also become something of a tourist attraction; however when we visited the temple we only noted one other western tourist walking among the Hindu worshippers and rats. 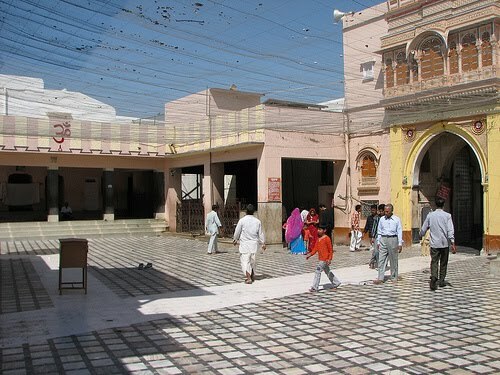 Most tourists visit the temple as a half-day trip from Bikaner, the nearest large city to Deshnok. We had a guide and driver for the day and our journey to Deshnok was included. As with all Hindu temples, visitors must remove their shoes before entering. It is allowed to wear socks and this is recommended. The temple floor is not filthy, but you do run the risk of accidentally stepping on some rat droppings as you tour the temple and courtyard. 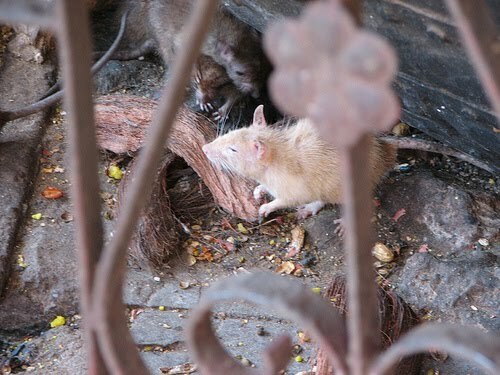 It is said that it is good luck to see a white rat at Karni Mata, and during our visit there were plenty of young men who offered to find a white rat for us. It is also good luck when a rat runs over your foot. This is easy to accomplish; there are some heavy rat-traffic areas along walls between rooms, and if a foot is placed in the path, it will get some rat prints on it. Gone are the days when a tourist had to languish in his hotel room after sunset in Jaipur.Now they have many options to enliven their evenings besides just having dinner and going to bed. How would you like to spend your Evening? Would you like to shop some more? Head to Guarav Towers,Malviya Nagar and you will find branded shops full of Shoes,Clothes,Music,Movies on DVD, Books,Coffee Bar,Bargains for Rs.99/-,Bakers, Restaurants including the Mac.If you want some more choice step across to yet another mall just a stones throw away. If you do not believe in the mall culture and like to practice the art of bargaining then Bapu Bazaar,Nehru Bazaar,Hawa Mahal Bazaar and other Bazaars in the walled city are for you.Window shop at a leisurely pace amongst the bustle of the people, hawkers, rickshaws, autos,urchins,cows and the ever present honking traffic. And a mute witness to it all are these Red lime washed walls of monuments of times no more and you . 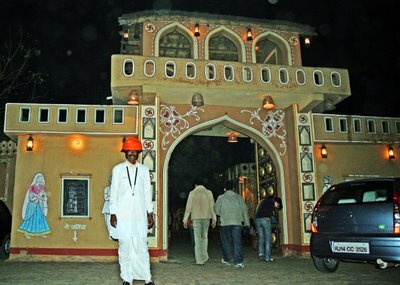 In the mood for a long drive-head for The Chokhi Dhani-Ethnic Village Restaurant( 0141-2770556) on the Tonk Road.The menu and service is traditional rajasthani.There are potter,folk dancers,snake charmer,madaari and a future reading parrot.Camel and elephant rides.Lac bangles for sale. If you do not feel up to the long drive but want a good north Indian meal under the belt head for “Shree Thal” restaurant behind the New Vidhan Sabha,near jyoti nagar police station.If in mood for top of the line multi cuisine vegetarian fare head for the “Four Seasons” on Subhash Marg,C-Scheme(0141-2374601). How about some Chaat? Chawala’s in Raja Park is the place for you. Are you thinking Non-Vegetarian?No visit to Jaipur is complete without a meal at the Niros (0141-2374493)on the M.I.Road. Another choice - Copper Chimney (0141-2372275),opp. G.P.O. Spice Court (0141-2220202)on Jacob Road. Or just feeling like a Pizza-Pepsi only? There is Pizza Hut(0141-2388627),Ganpati Plaza,M.I.Road and Dominoes(0141-2378526),near Raj Mandir Cinema Hall. Looking for a Gujarati meal-there is “Anapurna” behind Raj Mandir-near the gujarati samaj complex. And the Rajdhani Restaurant above the Mac on Panch Batti Circle. A south indian meal is readily available at” Sankalp” and “Dasaprakash” (0141-2371313) on the M.I.Road. But the night is still young.What night ends without pubbing. Geoffrey’s the pub (0141-2360202)at the Park Plaza and Bar Code at The K.K.Square on Prithviraj Road,Steam (0141-2211919) at The Rambagh Palace and Back to Basics at Country Inn & Suites (0141-5103300) on khasa kothi circle. Or just looking for a cup of that perfect coffee before you turn in for the night -Barista in Mall 21,opp.Raj mandir. Mr.Beans(0141-2223650) & The Rock (0141-2360622)on the Sardar patel Marg,C-Scheme. If you think no holiday is complete without a hindi movie-we have just the place for you-The Raj Mandir Cinema Hall(0141-2379372).In this day and age of multiplexes-a single screen theater-built like no other and worth a visit. For the culturally inclined-Birla Auditorium & Planetarium (01412385224) on Statue Circle, Jawahar Kala Kendra (0141-2705879),opp.Commerce College or Ravindra Manch (0141-2619061) in the Ram Niwas Garden.These places come alive during the yearly fixtures of Jaipur Festival & Rajasthan Day celebrations conducted by the RTDC and The Jaipur Virasat Foundation.A not to be missed yearly event is the increasingly high profile Jaipur Literature Festival with writers galore. 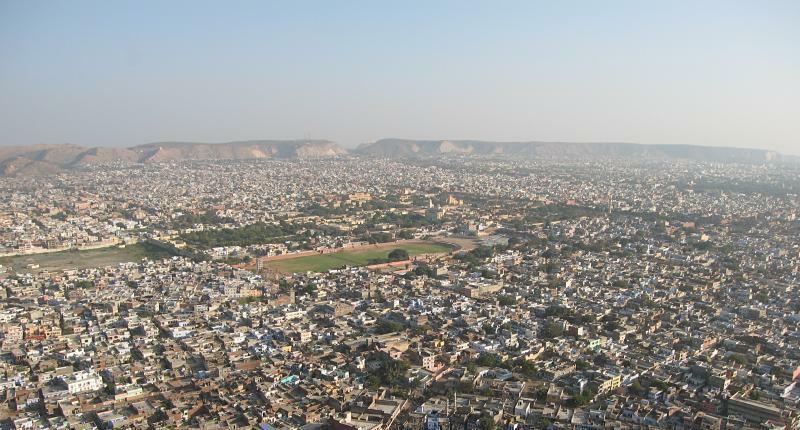 Jodhpur is the second largest city of Rajasthan. Jodhpur is a popular tourist destination of Rajasthan featuring many palaces, forts and temples. City was founded by Rao Jodha in the year 1459. 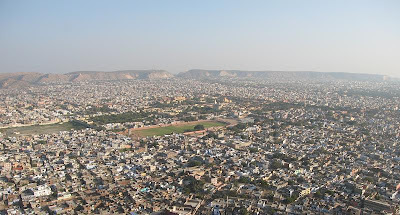 Old Jodhpur city is surrounded by 10 km long boundary wall which was constructed 100 years after the city was founded. Jodhpur is also known as the Blue City because of the indigo tinge of whitewashed houses around the Mehrangarh Fort. City offers large number of tourist spots. Some of the must visit sites of Jodhpur are Mehrangarh Fort, Umaid Bhavan Palace, Jaswant Thada, Raj Ranchhodji Temple and Umed Garden. Mehrangarh fort is located on 125 m high hill. It is one of the largest forts of India. Mehrangarh fort reminds of the royal past of the Rajput. There are several attractions inside the fort like palaces, galleries, museum and temples. Jaswant Thada is located near to the Mehrangarh Fort. Royal cenotaph made up of white marble, Jaswant Thada was built in 1899 in memory of Maharaja Jaswant Singh II. 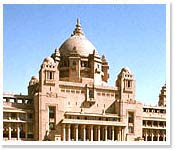 Grand structure of Umaid Bhawan Palace was built for the purpose of giving employment to the people during the long draught which struck Jodhpur during early 20th century. Construction of the palace started in the year 1929 and took 15 years to complete. Today the palace has been converted into a Heritage hotel, however, royal family still resides in one part of the palace. Balsamand Lake is a man made lake, located 7 km from Jodhpur and is a popular picnic spot. It was built in 1159 A.D. Adjacent to the lake there is palace called Balsamand Palace which was built by Maharaja Umaid Singh. Today, Balsamand Palace is a heritage hotel. Jodhpur has large number hotels, resorts and guest houses which suit tourists of every budget. There are many heritage hotels which offer royal accommodation with all the modern day facilities and amenities. There are many budget hotels which offer low budget accommodation in Jodhpur city. Shopping in Jodhpur is an exciting and rewarding experience. City is famous for handicrafts in wood, iron and camel bone. Sadar Market of Jodhpur is the ideal place for buying the handicraft items made by the skilled craftsmen of the region. One can buy Rajasthani textiles, clay figurines, miniature camels and elephants, marble inlay work and classic silver jeweleries. Air : Jodhpur airport has regular domestic flights from Delhi, Agra, Mumbai, Jaipur and Udaipur. Airport is about 5 km from the city. Rail :Jodhpur is well connected by rail from all parts of the country. There is train service for all the major cities of India from Jodhpur. Road : Road transport corporation of Rajasthan runs buses from Jodhpur for all the cities and towns of Rajasthan. Rajasthan, literally meaning ‘Land of King’ is biggest state of India area wise. About Rajasthan it is said that it is the place where all the country’s similes and metaphors appear to come together to created a visual extravaganza. Bestowed with magnificent palaces and rugged forts, wooded hills and tranquil lakes, bustling towns and quiet villages, amazing variety of flora and fauna, the colorful and vibrant people, the desert land of Rajasthan offers both unmatched and unforgettable experience. Whenever you travel across Rajasthan, particularly from the popular tourist destinations, you will come across the unexpected, whether it is a local village or a bustling city market or superb mind-blowing architectural wonders. In fact, the mood and the rhythm of landscape of Rajasthan changes from one region to another, and from season to season. On the whole, Rajasthan is a land of magical fantasies that remain in lifetime memory of the visitors. So, come and discover the magical land on your own. 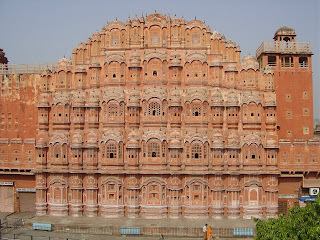 Jaipur : Also known as Pink city, Jaipur is the capital of Rajasthan. Founded by Maharaja Jai Singh II in 1727, Jaipur is the place where you experience the Rajput hospitality at its best. Established on the lines of Shilpa Shastra town planning, Jaipur is tempered with influences of Mughal and Jain architures of that era. Jaipur was painted in all pink in honour of Prince Albert who visited the city in 1853 and even today the city houses are painted in pink colour. Highlights of Jaipur include Hawa Mahal, City Palace and Museum, Jantar Mantar and Amber Fort. Jaipur is a paradise for shoppers, the city markets deal in the best tie and dye bandhnis, blankets, shoes and jewellery. Jaisalmer : Jaisalmer is an oasis in the desert breast of Rajasthan. Situated in the westernmost remote corner of Rajasthan, Jaisalmer with its golden sandstone town walls provides the visitors medieval and an incredible feel. Places to be visited in Jaisalmer are Jaisalmer Fort, the havelis (mansions) most popular one being the Patwon ki Haveli and the Gadisagar Lake. 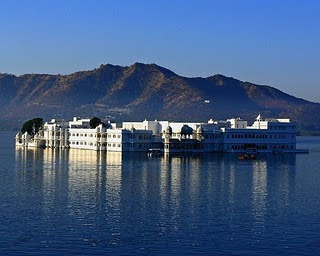 Udaipur : Often referred to as the ‘Venice of the East’, Udaipur is considered one of the most romantic cities of India. With its fairytale collection of exotic gardens, beautiful lakes and fantasy island palaces, Udaipur provides never before experience to visitors. Must visit places in Udaipur are City Palace, Jagdish Temple, Saheliyon ki bari and Bhartiya Lok Kala museum. Jodhpur : Jodhpur the second largest city of Rajasthan, lies on the eastern fringe of the Thar Desert. Mehrangarh Fort is the main highlight of Jodhpur which stands on a low range of sandstone hill with a 10 km long stone wall and eight massive entrances. Other places worth a visit in Jodhpur are Jaswanth Thadam a white marble cenotaph to Maharaja Jaswanth Singh II. Sardar Market and Bishnoi village are other places of interest in Jodhpur. 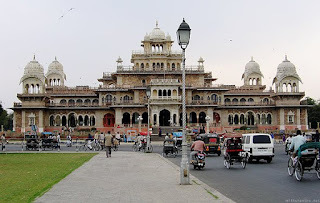 Bikaner : Despite being one of the famous towns of Rajasthan, Bikaner is not much crowded. Junagarh fort is the major attraction of Bikaner. Besides the fort, other attractions of Bikaner include the Camel Breeding Farm and Rat Temple. Bikaner is also famous for the Bikaneri namkeens and bhujias. Ajmer : Situated about 131 kms from Jaipur, Ajmer is known for the dargah of Khwaja Moinuddin Chisti, the founder of the Chisti order. People of all religions visit the Dargah for fulfillment of their wishes. Just 15 kms from Ajmer lies the Pushkar town known for its temples, especially India’s only temple dedicated to Lord Brahma. 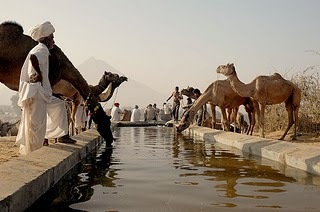 Pushakar Lake and annual Cattle Fair are other attractions of Pushkar. Wildlife in Rajasthan : Despite unending expanses of desert, Rajasthan is bestowed with a vast population of flora and fauna. Rajasthan is home to some of the important wildlife sanctuaries of India that include Ranthambhore National Park, Keoladeo Ghana National Park, Sariska National Park and Kumbhalgarh Wildlife Sanctuary. 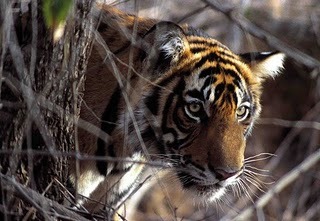 You can spot a variety of wildanimals and avian species in state of Rajasthan. People and Culture : People of Rajasthan are friendly in nature and they spend a colourful life. 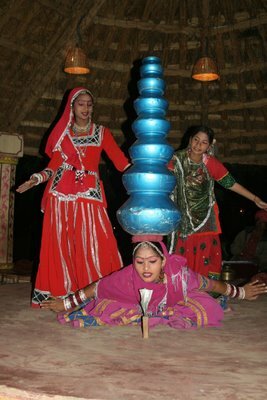 One can get a glimpse of typical Rajasthani culture in food, dresses, music, dance and fairs and festivals of Rajashtan. People of the state celebrate a number of festivals all round the year that include regional and religious festivals. Some of the famous fairs and festivals of Rajasthan include Pushkar Fair, Camel Festival, Elephant Festival, Desert Festival, Teej Festival, Gangaur Festival, Nagaur Festival, Mewar Festival, Kite Festival and Shekhawati Fair. 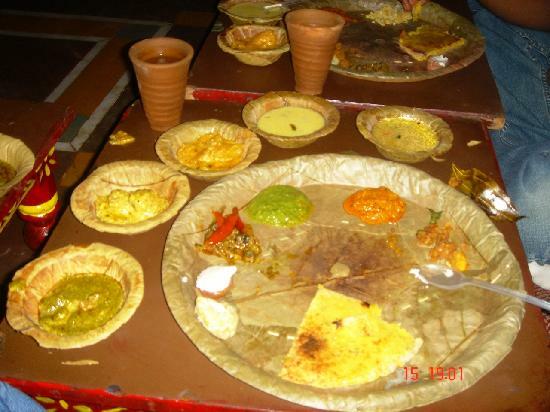 Rajasthan savour some of delicious food served in North India especially the non-vegetarian food. Adventrue in Rajasthan : Desert land of Rajasthan offers excellent opportunities for adventure seekers. One can enjoy adventure sports like paragliding, ballooning, boating, trekking, camping, camel safari, jeep safari and horse safari in Rajasthan. 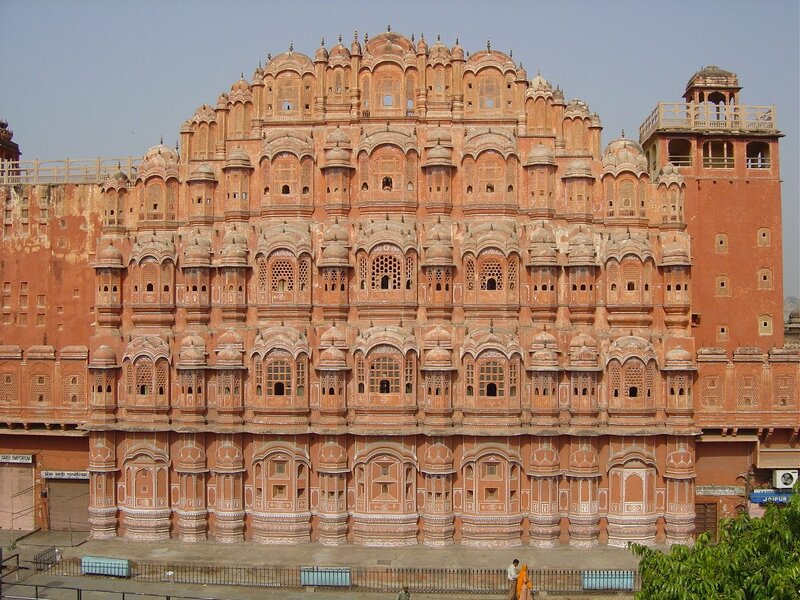 Also known as the ‘Pink City’, Jaipur is the capital city of the state of Rajasthan. It was founded in the year 1727 A.D by Maharaja Sawai Jai Singh. Named after its founder, the city is one of the first planned cities in India . 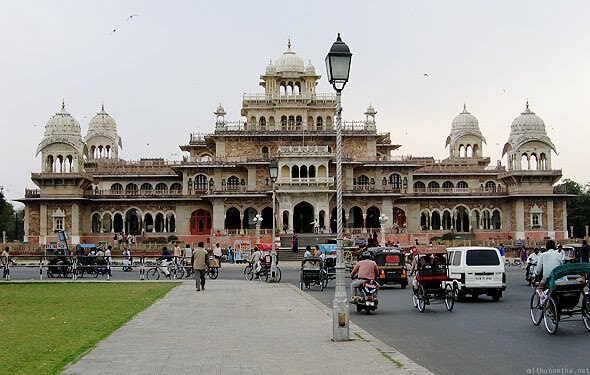 Jaipur is a sought after tourist destination in the state, owing to its rich historical past and age old grandeur. The royal fervor can be evidently experienced from the ancient monuments dotting the city, lifestyle of the people, culture and the food. Surrounded by three magnanimous forts, carpeted with lush gardens and splashed with serene lakes, a visit to Jaipur is a sheer delight for visitors. 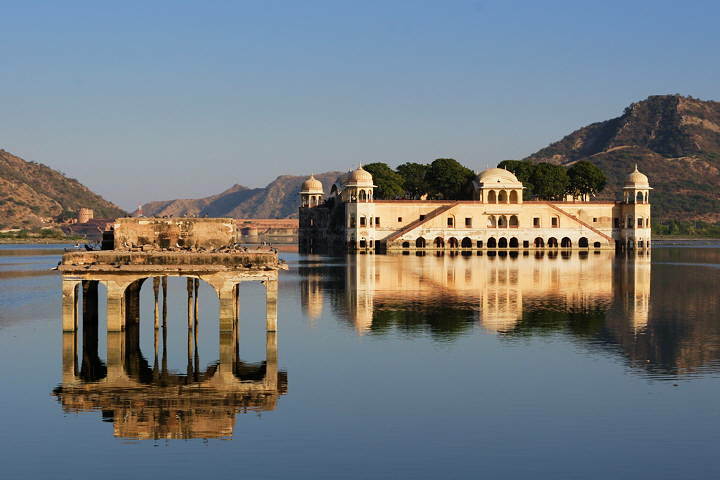 To know some of the major tourist attractions and places to see in Jaipur, read on. Built by Maharaja Sawai Jai Singh, the palace is an excellent blend of Mughal and Rajasthani architecture. On entering the palace complex, the first structure is Mubarak Mahal, built by Sawai Madho Singh in 19th century. It now houses a museum dedicated to Maharaja Sawai Man Singh II, showcasing royal costumes and bulky clothes worn by former rulers. The Diwaan-e-aam houses an art gallery displaying rare manuscripts, scriptures and paintings. Hawa Mahal is the main landmark of Jaipur. Built by Maharaja Sawai Pratap Singh, the five storied pink sandstone structure is known as the Palace of Winds, as it boasts of 953 intricately carved windows overlooking the busy bazaar street. Originally, constructed for the royal ladies, this is an excellent example of Rajput architecture. Apart from providing an extensive view of the city, the sunset viewed from its latticed windows is an unforgettable experience. houses ancient astronomical instruments chiseled out of stone. The most interesting instrument here is the Sundial. The shadow cast on it helps in the determination of local and meridian pass time. Besides, varied attributes of the heavenly bodies can also be calculated with the help of it. Also known as the Lakshmi Narayan Temple, it is located near the Moti Dungri Fort. Built entirely out of white marble, the temple is dedicated to Lord Vishnu and Goddess Lakshmi. The temple has three domes which represent different approaches to religion. A major tourist attraction, the temple is highly crowded during festive time. One of the oldest museums in the state, Albert Hall museum is situated amidst the sprawling Ram Niwas Bagh garden on the outskirts of Jaipur. 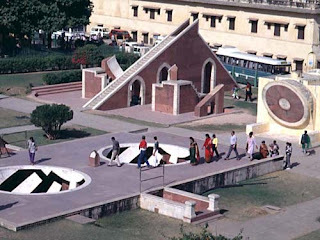 The museum combines the fine elements of English and north Indian architecture and was opened in 1980s. It houses rare royal artifacts, miniature paintings from different schools of Rajasthan, carpet by Mirza Jai Singh I from Shah Abbas of Persia and an Egyptian mummy belonging to the Ptolemaic Epoch. Situated on the foothills of Nahargarh Hills, these are beautiful landscaped gardens with an intricately craved temple made of beige stone. The sprawling complex is laid with terrace sites, marble columns and lattices. The place is quite popular amongst picnickers and film makers owing to its splendor. The ideal time to be around here is during monsoon, as it sparkles after being washed from the rain water. Popularly known as the Amer Fort, it is one of the most magnificent monuments, situated on the outskirts of the city. The ruling fortress of the Kachhawa clan of Amber, it is an excellent blend of Hindu and Mughal architecture. The interiors of the palace are laid with expressive painting scenes with carvings, precious stones and mirror settings. 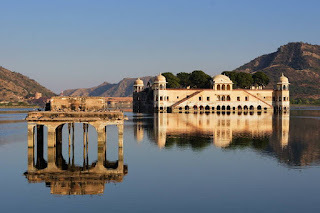 Some of the other places worth visiting in Jaipur include Jaigarh Fort, Nahargarh Fort, Jal Mahal, Govind Dev ji Temple, Galtaji, Gaitore, Sisodia Rani Ka Bagh, etc. Besides, Jaipur is a paradise for all those, who love shopping and food. The ethnic items showcasing the traditional and royal art are a must buy here. 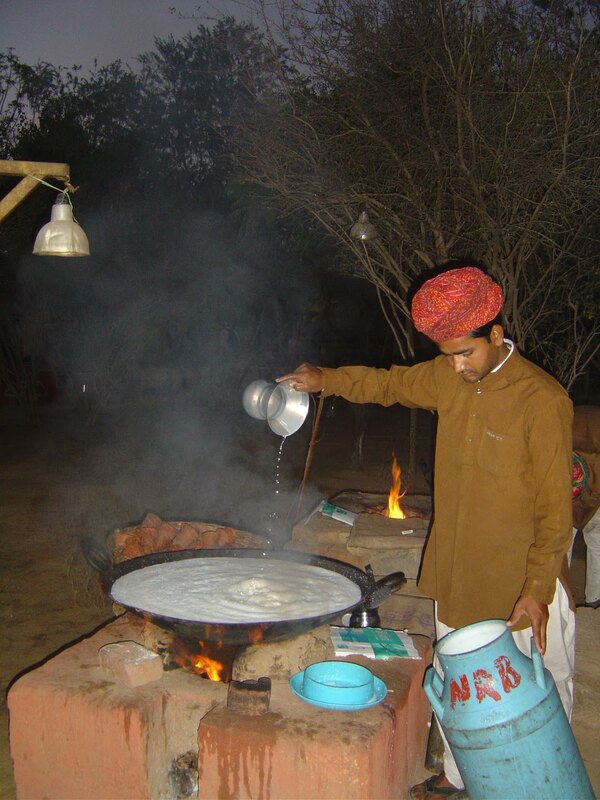 Furthermore, you can pamper your taste buds with delicious Rajasthani cuisine and delicacies. 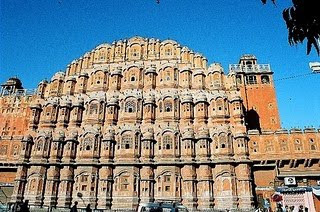 In effect, Jaipur has proved to be a must visit tourist destination in the desert yet enigmatic state of Rajasthan. Owing to the fact that Jaipur is a popular tourist destination, it houses a number of varied accommodation options catering to visitors from all economic backgrounds. The 5 star hotels in Jaipur include Le Meridien, Hotel Clarks, Hotel Mansingh, Oberoi Rajvilas etc. Apart from this, there are a host of heritage and budget hotels in the city. The nearest airport is situated 10 km from Jaipur, which is known as the Sanganer Airport. It operates domestic flights which connect it with Delhi, Kolkata, Mumbai, Ahmedabad, Jodhpur and Udaipur. 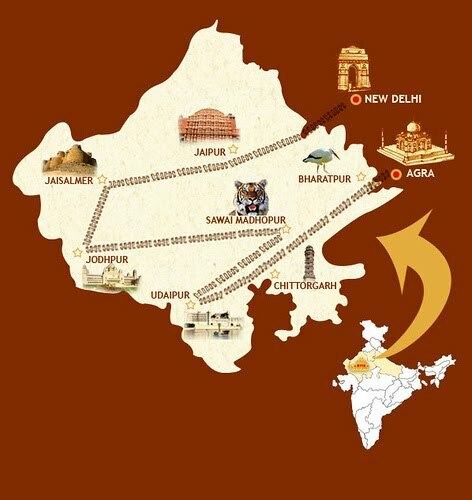 Jaipur is well connected to all the major cities of Rajasthan and India by trains. There are regular trains to cities like Delhi, Agra, Chennai, Jodhpur, Mumbai, Udaipur, Bikaner and Ahmedabad. A well-developed network of road connects Jaipur to important places in Rajasthan and north India. Private as well as government buses ply from here at regular intervals which connect Jaipur to all the nearby major cities such as Delhi and Agra.